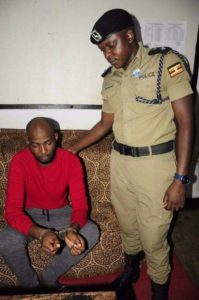 A man accused of causing bodily harm and inflicting injuries that led to the death of music icon Moses Ssekibogo aka Mowzey Radio was on Sunday arrested by police in a hideout in Kyengera, a city suburb. Godfrey ’Troy’ Wamala was found at a friend’s place in Kyengera where he has been hiding. He is now being held at Katwe Police Station, police said on Sunday. According to the police, he will on Monday be transferred to Entebbe Police, the jurisdiction of where the offence was committed. He will be charged with murder, authorities said. Mr Ssekibogo died last week at Case Hospital in Kampala following head injuries that he sustained from a fight that took place at De Bar in Entebbe last week. He was buried in Nakawuka, Entebbe on Saturday. Early this week, Mr George Egesa, the proprietor of De Bar and his friend Xavier Rukere were arrested and are still being detained at Entebbe Main PoliceS where a case file number SD REF 85/22/01/2018 was opened amid investigations. After the death, police swung into action arresting the supervisor of De Bar to help police in their investigations. Entebbe authorities have since closed the bar.